Democratic Republic of the Congo recorded its largest one-day increase of Ebola cases yesterday, as the country's deadly outbreak shows no signs of slowing. A further 14 cases of the virus were confirmed yesterday, taking the total to 713 cases since the epidemic was declared in August. Nine of the new cases were in Katwa, a city of a several hundred thousand people just outside Butembo. 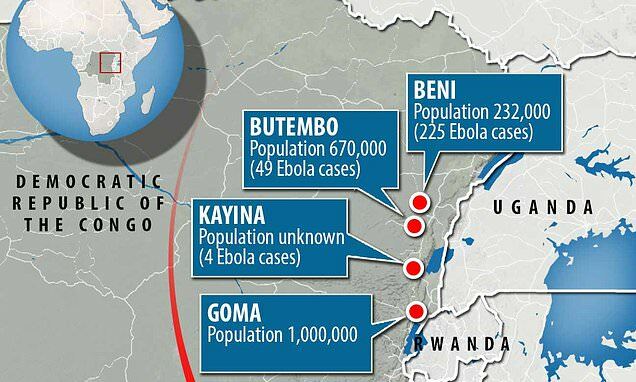 Several other zones in this district have been hit already, and fears are growing that the disease could spread into Uganda and Rwanda. The virus has already taken the lives of 439 people, making it the second worst outbreak in history, after the 2013-2016 outbreak in West Africa.